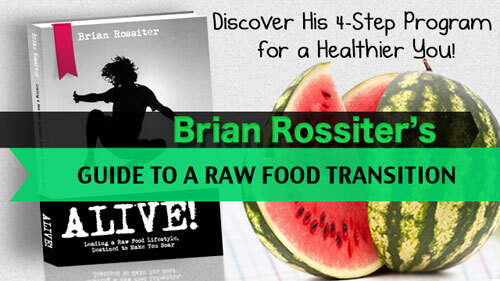 Brian Rossiter is a 'near fruitarian' and has been a 100% raw food vegan for three years. He agreed to share his amazing healing story with us in this interview. Brian runs a website: Fruit-Powered.com and he also lectures and teaches regularly at the Arnold's Way raw food restaurant in Philadelphia. He is the author of many ebooks, and offers specialist advice to people on raw food recipes and on how to be healthy. In this interview Brian discusses his journey to raw foods and the benefits he found, as well as giving specific answers to my tricky questions! Brian Rossiter teaching a salad dressing class at the Arnold's Way raw food restaurant. When did you become a raw foodist and why? I went raw because I felt fantastic after consuming green smoothies for breakfast and then having them twice a day. I became vegan instinctively, after my body told me it no longer wanted any animal products, thanks to consuming daily green smoothies. I joined a friend in going wholly raw for all of January 2011. I made it the whole month but didn't truly succeed. After a few months, I discovered a fruit-based raw food diet, and once I dropped cooked food entirely, I began thriving and rejuvenating. Going raw is the best thing I ever did for myself. I ate the standard American diet. By my late 20s, I began having 200-calorie fruit smoothies for about five breakfasts a week and small salads with dinner a few nights a week. I was also eating plenty of meat in the form of chicken tacos, white chicken chili, chicken wings, burgers and steaks as well as pasta. From age 27 to 32, I began to feel the effects of an aging body. I simply no longer had the energy of myself from even a year or two earlier. At 32, I began drinking green smoothies. What was the transition to raw foods like for you? My path of green smoothies had led me to a raw vegan diet. 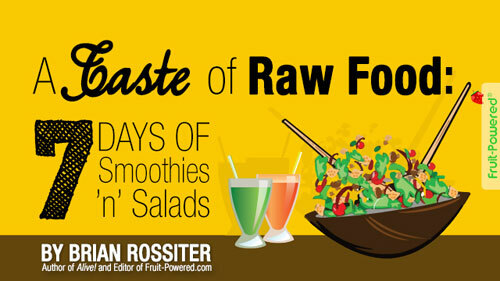 When I went raw in January 2011, I went the whole month 100 percent raw. Come February, and for almost 13 months, I ate cooked food—almost exclusively vegan burritos — about three nights a week. I didn't think I wanted to be 100 percent raw back then, but as 2011 advanced, I began feeling worse rather than feeling better. I went wholly raw again in December 2011 and learned that I had to give up the burritos for me to feel my best, but in 2013, I would cave for another few burritos over the first eight weeks, with each burrito sometimes spaced out two weeks at times. "Did I really have to give them up for good or could I have them every once in a while," I wondered. Near the end of February 2012, I went wholly raw and haven't looked back. (Ulla:) In the first year that you were a raw foodist, you said you felt healthier and near-instant energy, but you also felt brain fog and spacey. But later, being 100% raw and following Douglas Graham's 80/10/10 diet helped you overcome that. Why do you think that was? The vegan burritos I enjoyed about three nights a week tasted good but didn't treat me well. Ingredients in them overshadowed my then-90-percent-raw diet. My body had simply cleaned out too much, making me sensitive to any foods considered suboptimal, which the burritos were. I had to follow Natural Hygiene and the 80/10/10 Diet perfectly for me to achieve excellent results. (Ulla:) In your interview in Dr. David Klein's Vibrance Magazine, you say: "For the first time in my life, I am the real me, tuned into who I am, where I am, where I am going and what I want in life." How did you succeed in becoming this new person and how did the raw food diet help? My goal is to live simply — with humble appreciation for the taste of watermelon, the music of the birds and crickets, the softness of cats, the lure of sunsets — and to serve the world by turning people on to a fruit-based raw food diet. I've stripped away lots of old distractions and ideas about who I was and how I should live and found peace, clarity, focus and ambition. What is the raw food scene like where you live? In Philadelphia, there was no scene that I was aware of in 2011 to mid-2013, when I left the city. In Lansdale, about 20 miles northwest of the city, is where all the action was. I used to live in this small town and met Arnold Kauffman when he moved the raw vegan café 'Arnold's Way' to Lansdale from Manayunk, a Philadelphia neighborhood, in 2002. I was a 24-year-old newspaper reporter at the time. I came back around to Arnold's Way in May 2010 and have been a fixture in the community ever since at our monthly potlucks. I've given recipe classes at Arnold's Way on several occasions in 2013 and 2014. Arnold's Way group photo by Megan Elizabeth. Could you explain how you reversed chronic pain naturally? The good folks at the Egoscue Method — my exercise therapists were Mike Kenny and Joan Adams — showed me how I could bring my body into proper alignment so I could experience not only a pain-free life but begin getting into the best shape of my life. Pete Egoscue's 'Pain Free' is an excellent book, but because I suffered from pain and misalignment (I would later learn, in so many bodily regions), I needed one-on-one care. Mike was my first trainer, and he showed me how to do simple stretches and exercises for me to begin reversing the chronic back and neck pain and carpal and cubital tunnel syndromes, which affected my fingers. I had lived with this pain for 10 years, and it was getting continually worse. My way back to proper posture and a resultant pain-free life was a zig-zag. It took several months until my body began to strengthen itself from doing these 'e-cises', as they're called, for me to feel comfortable. In time, I improved my posture and gained muscle, leading me to other exercise. I've been practising the Egoscue Method on a near-daily basis for almost five years. I swear by it — just like a fruit-based diet — and recommend it to everyone! Are you in perfect health now? My goal might be perfect health but I'm content never to achieve this. Even if I did everything right, I still have to walk down streets and breathe in fumes from vehicles and contend with other environmental and human-made toxins. At 37, I am in the healthiest state I've ever been and know that I'm continuing to rejuvenate, feeling younger all the time. What are the most amazing benefits of raw foods you have felt? I enjoy being present in the moment and experiencing crystal-clear mental clarity and focus along with boundless energy. My ambition and sense of purpose have risen to levels I've never dreamed of. Finally, I'm tapping into my potential and am excited to learn and master practices such as meditation to continually unlock my potential. Yes and no. I often interchange the words "fruitarian" and "mostly fruitarian." Fruit comprises the bulk of my calories, but I also eat greens and a healthful amount of nuts and seeds on a regular basis, so "mostly fruitarian" is the term that best describes me. (Ulla:) Many fruitarians seem to feel brilliant at first and after a few years to become deficient in key nutrients. Do you agree? Some continually feel extraordinary and others decline in health. I think it's important to read when adopting this lifestyle and get information from a variety of sources you trust. I also think it's important to make supplementation a key focus of study. I supplement in some key areas — Vitamins D3, B12 and K2 and with barley grass juice powder — to help me stay healthy. Why is fruit so much better food than anything else for a human, in your opinion? (Ulla:) Doesn't it cause problems with blood sugar? What do you say to doubters of fruitarianism - is there any proof that it works? We are designed to run on sugar, and fruit delivers us this fuel in the best-tasting, easiest-to-digest package. If fruit truly were the blood-sugar culprit many in the health-care establishment make it out to be, then it would be impossible for so many Type 2 diabetics such as Toni Allen to reverse her health condition. Tasha Lee, Robby Barbaro and Cyrus Khambatta have Type 1 diabetes but are doing much better on a fruit-based diet than on any other diet they've tried. All their stories — plus about 70 more — are on my website as part of Fruit-Powered Digest. I'm building a large tapestry of transformation stories so people can be convinced of the powers of a low-fat raw food diet. Doubters would have to give this diet an honest run for a sustained period of time before being able to cast legitimate doubt. Even if they haven't mastered it after, say, three months — and I wouldn't expect most to — I can just about guarantee that everyone would say they feel better than they did three months ago. Do you ever get cravings for cooked or unhealthy foods? Not at all. I can still have a sense of appreciation for the smells of some cooked foods, but I know these foods aren't fit for consumption, and I would not entertain the thought of eating them, let alone eating for entertainment over optimal fuel or raw foods. Did you find that you had to change your life radically when you became a raw foodist? I found that I shed many layers of societal conditioning that told me we are to enjoy ourselves in food and entertainment as part of a consumer culture. I see two worlds now, and I'm happy living as much as possible in the "natural world." In this world, I enjoy life's simple pleasures: raw foods and time spent with other living beings in nature. Things I used to enjoy such as watching movies and going to rock shows rarely and, in some cases, never resonate with me anymore. What I really want is freedom, and now that I've discovered freedom from cigarettes, alcohol and cooked foods, I am pursuing a lifestyle in which I life off the grid as much as possible. I can tell you I would still enjoy going to see Pearl Jam play, though. There is something magical about their energy, and I still crave this experience even after going to 21 shows. (Ulla:) A quote from your website: "To go raw, one really has to want this lifestyle badly enough to change his/her mindset's station from the rest of the world's frequency." Could you elaborate? When someone starts his or her raw food journey, the rest of the world—family, friends, co-workers, stores, advertisements and all the rest—will tell them it's cheeseburgers that they should be eating. You have to change the channel and dial into a new frequency, trusting yourself and looking to other raw fooders in person, on the Web and in books and videos for guidance and support. (Ulla:) Don't you ever miss belonging to the 'frequency' of 'this world' and its people? 'The Yoga of Eating' -book says that there is work for us to do in this world and its lower vibration levels. It also says that sometimes too high-vibrating foods may be in discord with the lives we live, and this disharmony can cause health problems and other problems in life. As much as I play with the idea of completely "dropping out," I don't think I have this in me. I have too much to share, and my instincts tell me I have to help others find their way, just as I continue to find mine. I owe a lot to Arnold Kauffman for his guidance and influence. He is leading a life of purpose, mission and passion, and I respect this very much. I'm still learning how I can do the same and have the impact he's had. Starting my website, Fruit-Powered.com, has been my way to serve, and I want to produce content for it for a very long time. I'm fortunate that this community shares their stories as well and am grateful to regular guest writers for their incredible contributions. Is it necessary to be 100% raw to be healthy? I think it's necessary to be 100 percent raw if you want to feel your best. I am so glad I went wholly raw because I know I wouldn't have the drive in me to do my best work with a diet of anything less. All this said, I know many who are enjoying life and great health eating vegan diets containing at least 80 percent raw foods in total calories. For some of these people, they might've experienced stress while being 100 percent raw, and so it's better for them to "relax the rules" and eat cooked vegan foods for dinner a few nights a week. Food is a huge component to health but not the only factor. "I challenge everyone to go 100 percent raw to find their true selves for the first time, to cherish the gift of life on the deepest level." - Brian Rossiter in the Vibrance Magazine. (Ulla:) I have felt this as well, my mind was much more upbeat, I felt more clever, more focused, and funnily enough, time seemed to slow down (perhaps because I could focus better), on raw food diets and juice fasts. But I don't seem to be able to make it last. I end up feeling somehow deprived when eating a strict diet and I think it has partly to do with the lack of energy and partly with not being able to relax. Do you have any advice? I'm so glad you've experienced these positive qualities of being raw! Having feelings of deprivation can take time to wash away, but I no longer see myself as deprived. Rather, I see myself as enjoying abundance. I don't pine for too many experiences I enjoyed in my pre-raw days. Regarding your lack of energy, which is in contrast with your inability to relax (I experience this too, most times, because I want to do so much! ), I would say it's possible you might need to eat more fruit, sleep more and/or read up on whether you might be deficient in something such as Vitamin D.
If you are leading a low-fat raw food diet to a "T" and not consuming animal, cooked or processed foods as well as irritants such as garlic, onion and seasonings, you should thrive after a period of time provided that all the other factors are accounted for. These include consuming enough fruit calories, greens, sleep, sunshine, supplementation, etc. I haven't heard of Arnold's Way before. Could you tell us about it? Arnold's Way is a special place owned by Arnold Kauffman, who is a larger-than-life character and must own the world record for hugs given. It's a raw vegan café that opened in 1992 as a vitamin shop in a Philadelphia neighborhood and shifted to serving the raw vegan community in the late 1990s. Since 2002, it's been located in Lansdale, Pennsylvania, a Philadelphia suburb. Quite simply, Arnold's Way is the Raw Food Capital of the World. There likely are more raw food success stories out of the Arnold's Way community compared with any other place in the world. No other café offers the volume and depth of events, speaking engagements, classes and other activities. It's also home to the 30-Day Raw Challenge, which enables the community to go raw and learn about this lifestyle for a month for an affordable price. Arnold's Way has become a post-Woodstock Fruit Festival hangout the past couple of years. It's welcomed folks from Poland, South Africa, Brazil and throughout the United States in recent years. If you're a raw fooder, your pilgrimage should be to Arnold's Way to spend a few days. 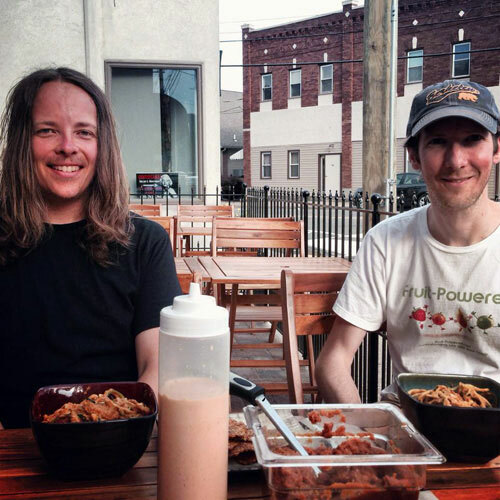 Brian Rossiter with Nucleus Raw Foods owner Dan McGrogan, enjoying Dan and café chef Kamri Jacobs' spin on Ashley Clark's 'Low-fat Raw Vegan Mac'n Cheeze' with raw ketchup! Is it important to do a high amount of exercise to succeed on a long-term raw food diet? No. I recommend daily to near-daily activity, and I enjoy the Egoscue Method to keep me loose, strong and feeling fantastic. I think exercising for the sake of pushing limits can be damaging to the body. I like to approach things based on this question: "What would I do in nature." The main things would be to walk and climb trees for fruit. If we wanted to eat every day, we'd climb trees every day. I also balance this question with: "What should I do to compensate for the fact that I'm not living in nature." Ultimately, the Egoscue Method's stretches and exercises aren't what we'd do in nature. But, in nature, we wouldn't sit or stand in place most of the day either. Could you explain a little more about the Egoscue method? "The Egoscue Method fills the stimulus gap created by the sedentary modern environment with a unique program of exercises targeted at muscles and functions that are receiving inadequate or improper motion. [...] Egoscue Method tutorials are designed to return compensating and substituting muscles — those that are performing nondesign functions — to their design roles." Most 'e-cises' are completed while standing or while laying on a floor. Simple equipment such as steps and boxes are for some 'e-cises', short for "Egoscue Exercises" as the exercises and stretches are called. Ultimately, the e-cises — including shoulder rotations, hip openers, sit-ups and back arches, or bridge pose, in yoga (I do about 20 e-cises and a few additional bodyweight exercises a day) — help restore the body to correct posture. With this correct posture, our eight load-bearing joints — two shoulders, two hips, two knees and two ankles — return to their proper structural alignment. The result is a body free of pain, able to better prevent and withstand injury and geared for optimal performance in life and in athletics. (Ulla:) The high-energy levels other raw-foodists report have so far eluded me. Even when 100% raw I still needed nine-hours of sleep per night and sometimes more. Have you heard of other people having the same problem? I slept for about six hours a night when I was still eating animal products but also having a lot of fruit, thanks to green smoothies twice a day, in summer 2010. Once raw, I needed more sleep. What I think happens is that raw fooders get in tune with their bodies' energy levels because they no longer mask themselves in caffeine doses, for example. The body finally — finally! — has a break to "clean house." And the body is going to do just this! Honor it and sleep well. The amount of sleep you need might vary in time. What would be the ideal place in the world to live in? I thought it might've been Thailand, but living there or in any other land where you're a foreigner presents challenges you cannot anticipate until you've lived there. I would like to check out Hawaii and possibly Florida sometime soon. Ideally, I would love to spend winters in a warm climate. All this said, viewing a place through rose-colored glasses can make us forget about the beauty before us. Could you tell us about your book projects? I launched five books in the first half of 2014. These were: 'A Taste of Raw Food: 7 Days of Smoothies 'n' Salads' and the four-volume 'Mouthwatering Recipes' book series. I have as many as 20 titles I'd like to release but need the time to do so. I have ideas for more recipe books as well as a comprehensive lifestyle book. These would be my next projects. I took a break from book production of my titles in the second half of 2014 to work with Arnold Kauffman on book projects. One title was released in June 2014, 'Healing Success Stories from Arnold's Way', and another three titles are expected to be launched in the coming weeks and months. I have a past career in the writing world as a newspaper reporter and copy editor-page designer, publicist and publications editor. For 2014, though, I've pursued a dream in becoming self-employed with my Fruit-Powered venture and expanding my services to include book publishing and editing as well as basic website help for other health educators. I also work a day a week at Arnold's Way. To help me gain the money to build or buy a tiny house, though, I will supplement my income with another job in the next year. 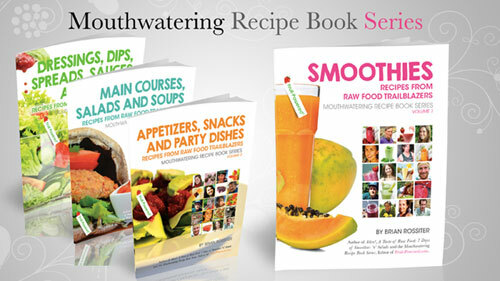 Brian Rossiter's 'Mouthwatering Recipes' book series is available from his website. What advice do you have for someone just starting out on raw foods? Start by replacing breakfast with green smoothies and commit to making and eating them every day. Commitment is huge. I had green smoothies for 1,250 days in a row from the day I started until I boarded a plane last year, breaking my streak. I tell people about this streak because I hear time and time again, that people didn't have ripe bananas or ran out of greens. If one makes a commitment to have a calorie- and greens-rich smoothie for breakfast every day for a month, the health change will be seismic. This will inspire further changes in a motivated person who reads voraciously about this lifestyle. Education and inspiration are so key in helping a person succeed. I'm doing all I can to deliver the best experiences on these fronts on Fruit-Powered.com. I encourage your readers to subscribe for free to my e-magazine, Fruit-Powered Digest, home to 73-and-counting transformation stories plus other articles, tips, recipes and guest stories by leading raw fooders Don Bennett, Korey Constable, Arnold Kauffman, Dr. David Klein, Karen Ranzi and Anne Osborne. Does raw food lifestyle have to be expensive? Living on a raw food diet tends to cost more compared with existing on a standard diet, but a true cost comparison should delve beyond strictly food costs. Most fruitarians or mostly fruitarians eat out less, saving money. They also don't partake in many social activities many others do, including drinking and entertainment choices. They also are much less likely to require expensive medical care. Buying foods from a wholesaler can help shave costs as can just buying cases of bananas instead of bunches. Organic is best, but if money is tight, eat conventional produce. I've had to do this at times and am still standing. The thought that organic produce contains no pesticides isn't actually true, at least in the United States. Another way to do it is to eat some conventional and some organic by buying organic staple foods such as bananas and organic greens. This way, the bulk of calories and all delicate, nutrient-rich greens come from organic sources. Do you have advice for people who are trying to eat raw or high-raw on a budget? I would suggest making cheap, calorie-rich and widely available bananas the bulk of calories consumed. I would also seek out wholesale markets, especially in cities, and farmer's markets. Also, look for no-frills food-only markets where the lights might be dingy, but the produce is abundant and bottom-dollar. To help increase variety, I also recommend frozen fruits. If you shop around, you'll find great deals at different places on different fruits. This is up to everyone to try for himself or herself, but I'd much rather eat conventional produce over organic cooked foods. Could you tell us about your e-magazine - what topics do you cover? Fruit-Powered Digest is my way to bring an element of the Arnold's Way experience to the world. No, people can't interact face to face with other raw fooders, but they can read informative, inspiring transformation success stories and get pumped up about what they can achieve on a fruit-based diet. My favorite Arnold's Way experience was learning from those having greater success on a raw food diet than I was having. For a time, I attended potlucks to learn from these folks and to feel inspired. I recall driving home to Philadelphia late those Saturday nights with such a rush, such energy, that I continued to advance on this diet, refining my approach. I want to deliver a similar kind of feeling in people, and let folks in Wyoming and Kazakhstan and all over the globe know that this diet is for real, that people are leading this lifestyle and that they can reverse cancer or feel their best at 70, too! The hallmark of Fruit-Powered Digest is its transformation stories. These take the shape of profiles written by me; what I call condensed "interviews" framed by me (not quite interviews but a series of targeted sentence starters designed to steer a conversation with participants); and, finally, guest stories. I'm publishing two of these stories a month after having published four a month for the Digest's second year. Cutting back on these transformation stories enables me to publish tips plus a recipe for each participant. The Digest also features regular articles by me, occasional guest feature and arts stories by others along with Fun Food Facts, which are light features on the foods raw fooders eat. Of course, regular guest stories by leading raw fooders Don Bennett, Korey Constable, Arnold Kauffman, Dr. David Klein, Karen Ranzi and Anne Osborne bring significant value to this publication. I consider these individuals to be outstanding leaders in this movement, and each has many special qualities to bring to the table. I'm fortunate to have grown this publication since its small beginnings as a monthly publication with only a few stories. I'm grateful to the whole raw food community. Readers can expect installments, as I call them, of about four stories to monthly issues most weeks of the year. Could you tell us what your book, Alive!, is about? When I was about 7, I recall not feeling alive for the first time. I reckon that by then, cooked and otherwise improper food had sufficiently produced in me a foggy feeling that I told my parents that I simply didn't "feel alive." It was like I was in a dreamworld. This feeling came and went. Once I started on my path to raw food, I felt alive "alive," if this makes sense. The word "alive" taps into something deep and meaningful in all of us, and it is the best word I could think of to name this book, about my twin paths to health (raw food and the Egoscue Method) and a four-step guide to transitioning to a low-fat raw food diet. The book also includes kitchen and home tool recommendations and insight from three Arnold's Way community members: owner Arnold Kauffman, author and YouTube sensation Megan Elizabeth and chef Shaie Dively. About 25 recipes — from smoothies to main courses — are enough to get anyone started. This four-step guide, which is a slightly modified version of the steps I took to go 100 percent raw, is geared toward helping most raw fooders, who want to transition over a period of time. It's set up in a way that makes this transition as natural and easy as possible. It's designed to produce success in willing readers who have the eye of the tiger to achieve their lifestyle goals. Quite simply, Alive! is the book I wanted to have during my transition. This is why I wrote it. Alive! Book by Brian Rossiter. You can visit Brian's website at Fruit-Powered.com as well as subscribe to his free raw food e-magazine here. He also offers one-to-one coaching.